Adventurer and mountaineer François-Guy Thivierge has conquered the highest peaks on the planet. 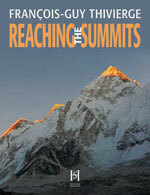 His book, aimed at both explorers and the general public, is a passionate account of the path that led him to reach the summits. Magnificently illustrated with images taken on the spot, this 240-page coffee-table book features over a hundred colourful photographs as well as fascinating texts about mountaineering and the art of testing one’s limits. Like a true world tour, the book takes the reader in turn to Aconcagua in Argentina, Kilimanjaro in Africa, Everest in Nepal, Vinson in Antarctica, Denali in Alaska, Elbrus in Russia and the Carstensz Pyramid in Indonesia as well as the North and South Poles. An area map, data sheet and useful information are provided for each destination. The author also reveals secrets of the human qualities that are the cornerstone of any achievement. François-Guy Thivierge is one of the rare individuals to have reached the highest summit on each of the seven continents and also to have explored both poles. He offers an account of an extraordinary adventure dotted with pitfalls, which for readers will prove to be a source of inspiration. All will uncover a breathtaking story and a lesson on how to approach personal challenges, whatever they may be. The volume will be published simultaneously in English and French in fall 2011. E-book in PDF.